The Novotel Narbonne Sud welcomes you to the heart of the Occitan region. Located on the Canal de la Robine, between the cathedral and the Roman ruins, be seduced by the beaches, the vineyards, the Massif de la Clape and Sigean's African reserve! 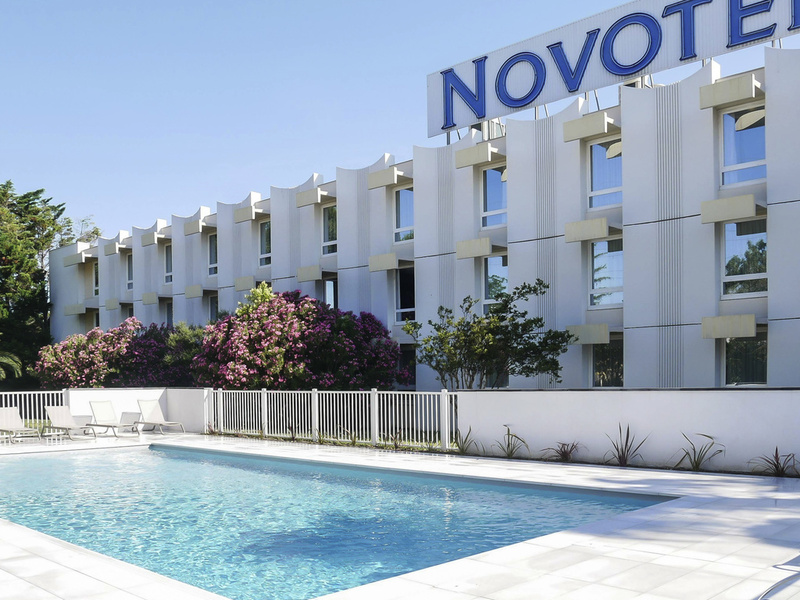 A sunny escape awaits you at the Novotel Narbonne Sud hotel. Between the beach and historic city center, the hotel will make your trip a breeze, whether you are traveling on business or with your family. Our rooms are spacious and modern and our meeting r ooms are elegant and customizable. Round off the day in the children's play areas, park with boules facilities or outdoor swimming pool. Be sure to try our tapas selection on the terrace. Everyone is invited, make yourself at home at Novotel. Spacious, modern and fully modular, the Novotel room is a true living space and can be adapted to suit all requirements. Each of our rooms measures 269 sq. ft. (25 m²). Choose the level of comfort that suits you, and discover the basic Novotel principles: 1 large bed and 1 sofa bed or couch in all the rooms, work area, bath, separate WC, safe, and a selection of drinks. Eat however you want, whenever you want. Come and eat at any time of day at the Bar Novotel Café and satisfy all your cravings. Take a moment to relax on the terrace, at the bar or in your room. The renovation in the bar area is a success; the openness of the area is more pleasing. The rooms continue to be comfortable and the change to a walk-in shower is a great improvement: more efficient and much safer. However, the rather silly shallow sink makes it very difficult to fill the kettle! Also, there was no laundry bag provided. the staff were great and helpful, the breakfast was boring bacon over cooked and scrabbled eggs very dry. As the most expensive of our four hotels in France, this was the least satisfactory. Our satnav found finding it quite difficult. The room was satisfactory and the evening meal good. Restaurant staff were very good - specially the older waiter. Great place, location and facilities are fantastic! Nice rooms, hotel and staff. Hotel cure being upgraded. Arrived and told no restaurant open that evening. We were directed to a restaurant outside only to be told upon arrival they had no heating. Having driven 400 miles we did not wish to drive into town on a very blustery and cold evening. There was no bar upon our return; just a barman who had access to some bottles in cupboards. Breakfast the following morning was good but we were on our own. We had an excellent stay over halfway to our destination in Spain from our home. I had a good time to relax and to groom myself. The rom was big enough. It was clean and there was no litter left in the room when I arrived. I was a little bit disappointed because your member of staff at the reception offered me an executive room for the Price of a basic room because the hotel was empty. But then he downgraded me to a superior room again because he said the upper floor would be renovated. We stay here every year on our way down to Spain. A great friendly hotel which we have been staying at yearly for the last few years, we would not stay anywhere else. The welcome and warmth of your staff was excellent. The biggest issue was having a toilet in the bedroom with no sink. Feels so unclean to have to open a door without washing your hands, knowing every previous visitor has done the same. Very kind personnel, both at reception desk and restaurant, as usual. Room and bed very comfortable Only recommendation: change the moquettes in the ailes! A good overnight stop. Dinner is available late evening which was very satisfactory. The staff were very welcoming and helpful. Room as expected which works well. Good value for money. Clean hotel, but had some problems. Clean hotel, fast efficient check-in. Room size average. Disappointed to find pool closed in October despite 26 degree temp. We had a problem with the room, but were changed to another room immediately which was great. Restaurant a little overpriced, food average. Breakfast was nice. Very pleasant staff and the usual quality of room. We enjoyed our stay at the hotel. The restaurant was quite good and we were grateful for the advice about the local Corbieres white wine. We also made use of the excellent swimming pool. Also the location was good both for visiting the city and for the etang to the south. On the negative side we noted that the carpet in the restaurant was dirty and badly stained. Also the checkout was perfunctory. It would have been nice to have been recognised as a club member.